Its really important to keep your horse or pony's hooves in top condition to avoid the common problems of thrush, splits and cracks which can cause lameness. Feeding equine feed supplements designed to provide the essential nutrition for equine hoof care can also help to maintain your horse's feet in top condition and help to prevent lameness. Here are some top equine hoof care tips. Start the right way - choose the right Horse! When you buy a horse remember that poor foot conformation can soon cause disease and lameness. Try to avoid future problems by choosing a horse with good shaped feet. Avoid horses and ponies with collapsed heels, long toes, flat soles, thin soles or contracted heels. As well as having the horse vetted when buying, ask your farrier for his advice too. Have regular visits from your farrier. A visit from your farrier every 5 to 6 weeks is adequate for most horses and ponies, but some horses feet grow more quickly than others, especially in the spring or when being fed supplements. 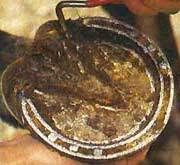 If your horse or pony does experience rapid hoof growth he will benefit from more frequent visits from a farrier. NEVER let your your horse's feet grow too long or allow them to get so neglected that he becomes lame. Keep bedding dry and clean. Good equine stable management is essential in keeping your horse's feet in good condition and will help to avoid problems like thrush. Thrush is caused by bacteria that, when trapped in moisture or damp conditions, creates a fungal infection that eats away at the horse's hoof tissue - nasty! Regularly pick out your horse's feet. It essential to pick out hooves at least once a day, preferably more, as part of your equestrian stable management routine. When you do this check for signs of thrush, heat in the hoof, cracks in the wall of the hoof, wounds and punctures. A hoof abscess can be really painful for a horse and needs to be treated quickly - call your farrier in the first instance - he can relieve the pressure and clean the area, you may also need to call your veterinary practice to prescribe antibiotics. When you pick out your horse's feet also check the condition of his shoes. Look out for raised or risen clenches and worn, cracked or twisted shoes. Losing a shoe riding out, in the dressage arena or in the field can cause a lot of damage to the hoof. A torn hoof can take many weeks to recover and there is also the danger of a punctured sole if the horse stands on the nails from the cast horseshoe. There are many hoof oils and hoofcare preparations and hoof dressings available which are designed to improve the appearance and health of your horse's feet. Your farrier may be able to recommend on that is particularly suited to your own horse's hooves. Diet has a big influence on the condition of your horse's hooves. Poor hoof condition may be the result of a vitamin deficiency or poor digestive system. Consider giving an equine feed supplement specifically designed to improve the condition of your horse's feet. Biotin is a popular ingredient. During damp and wet weather apply honey to your horse's frogs. Honey has natural anti-bacterial properties and is very useful in treating and preventing equine thrush. Try to get runny honey in a squeezy bottle - this is easiest to apply - just squeeze out the honey directly onto the frog then spread to the required areas. The best thing about this treatment is that it doesn't sting like many other preparations - so your horse or pony shouldn't object! If you do a lot of riding on roads ask you farrier to put at least one road nail in per shoe. This will help prevent your horse or pony slipping whilst being ridden out on slippery roads. Soaking your horse's feet in water can help the hooves to retain moisture during hot dry spells of weather. Apply plenty of hoof oil afterwards to help seal in the water.